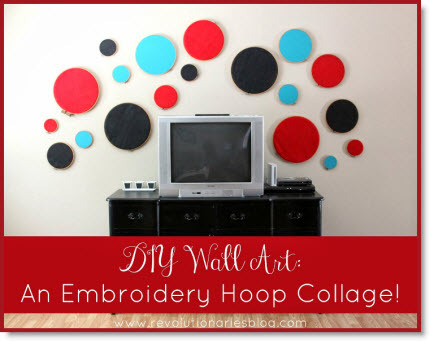 Bonnie of “Revolutionaries blog” has this clever idea on decorating your wall at an affordable price with her “DIY Wall Art: An Embroidery Hoop Collage”. You select the colors, hoop sizes and types of fabric that you love and create a wall collage that will enhance any room. This collage looks like it came from a high-end art gallery. Bonnie has a complete tutorial and I thank her for sharing.